Would you sooner eat a Brillo pad than speak in front of a group? Or are you already good, but you want to be more of a "Wow!"? Whether it's about generally speaking better or about a specific program that you need to focus on, Milo makes a difference people talk about. With his one-on-one, not-pre-packaged approach, he helps you boost your strengths and create change in areas that may be undermining you -- subtly or otherwise − in your public speaking skills. 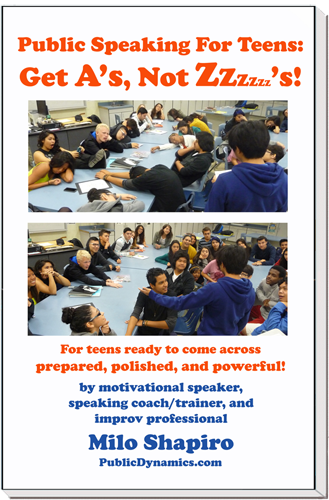 As the author of "Public Speaking: Get A's, Not Zzzzzz's" and its sequel "Public Speaking for TEENS: Get A's, Not Zzzzzz's! 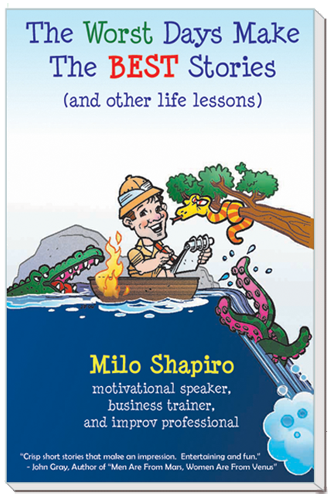 ", Milo blends his years of improv experience with solid platform fundamentals to make your programs more fun, interesting, powerful, and memorable. Most of Milo Shapiro’s clients are business professionals. From the C-Suite of large organizations (like Sharp Health Care and Precision Diagnostics) to team and project managers sales folks to solo-preneurs. Some want to generally improve their presentation skills; other need to be at their best for an isolated special event. Even wedding toasters, funeral eulogizers,and beauty pageant contestants have upped their game with Milo. Many times, it's the folks who just want to be seen as a rising star and want to shine amongst their colleagues to help in their career direction. Bottom line: If you’re going to be speaking in public, let Milo show you how to be more "Prepared, Polished, and Powerful" every time. The majority of Milo's clients work with him in a one-on-one coaching setting in person. Video teleconferencing is available for long distance clients or for those times when getting together, even locally, can't be accomplished. Milo also works with groups within organizations; sometimes all at once, sometimes in pairs or trios. Coaching programs are different for each person and customized accordingly. For example, the series would look completely different for one client who must be at her best for a big speech in six weeks than for another client who has no big event coming, but wishes to look better every time at her weekly staff meeting. Ellen works for the US Coast Guard. She dreaded giving briefings to her Commander and teammates because of her fear of speaking and knowing that she was floundering through it. After a few sessions together, improving her organization, rehearsal techniques, and delivery style, the Commander told her that, since she was now the strongest presenter in the office, she would be briefing the Admiral upon his visit. This was the last thing she'd want to do, but he said it was incumbent upon her because a good impression upon him was necessary. After more sessions, she presented to the Admiral, disguising her nerves behind a terrific and energetic performance. The Admiral was so impressed that he told the Commander that he wanted Ellen specifically to brief the Congressman when he came. Ellen called Milo and said, "Look what you've done! You've changed the trajectory of my career by being good at this!" The event for the congressman went so well that she was recommended to brief not only another congressman, but a chief financial officer who reports directly to the US President. All were noted as great successes that reflected strongly upon the Coast Guard. Not long afterward, Ellen called Milo for a brush-up before briefing a different Admiral. Upon her next visit, she reported fairly nonchalantly about how well things went. "Ellen," Milo noted, "in describing the event, you didn't use the word 'nervous' once!" "Oh yeah!" Ellen replied. "I was so excited to do the new stuff that we worked out, and it went over so well…I think I forgot to be nervous!" Professional member of the esteemed National Speakers Association since 2003. In 2000, Milo Shapiro walked away from fifteen years in Information Technology to pursue his then-ten-year passion: applying improvisation to business practices and personal development. One of his co-workers asked, "Who's going to make it fun to work here now?" His self-developed team building program, “TEAMprovising”, has forged team relationships, better communication, and heightened innovation for audiences as varied as techs at Sempra Energy, support clerks at Computer Science Corporation, and RNs at HealthSouth. As a professional member of the distinguished National Speakers Association since 2003, his most request program is his solo motivational speech, “We Gotta Fail…To Succeed!” (on our relationship with risk, change, and failure) where he also conducts the crowd in several interactive games. His two-man presentation "Laugh In The Fast Lane" is both a keynote and an improvisation show, utilizing ten improv games to make points on ten points. Topics like sales, management, and teamwork are fair game for them. Qualcomm, Pfizer, and Kodak have praised his creative methods. You can click a cover to learn more about each book and take a free preview the first 17 pages or so of it. 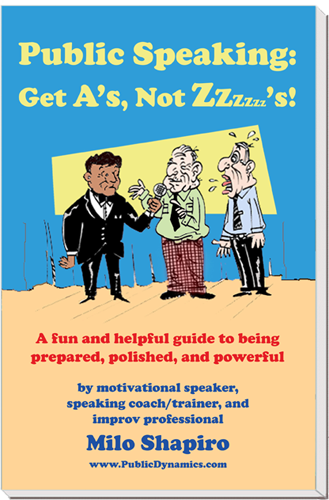 View a video with selections from his speech "Public Speaking: Get A's, Not Zzzzzz's!"